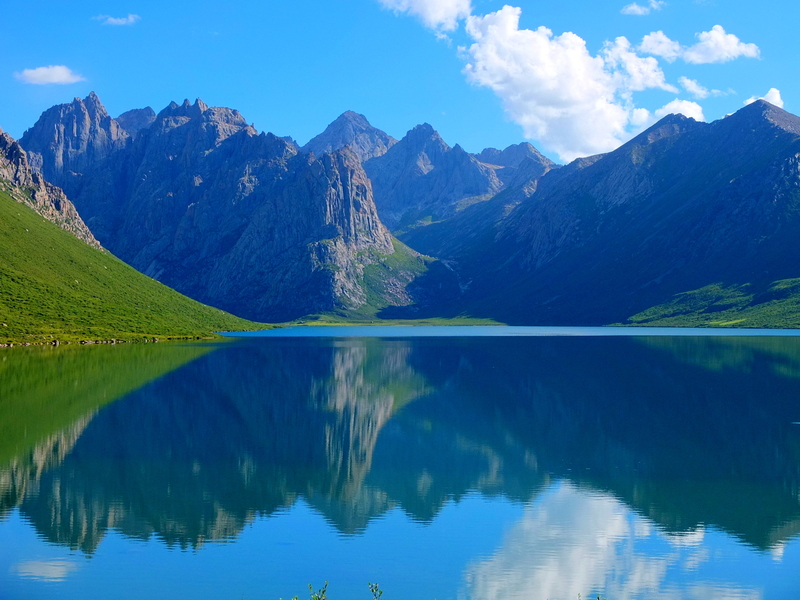 This mountainous region has stronger links to Sichuan’s Ngawa prefecture (which lies just to the souht) than to the rest of Qinghai. In the small, somewhat down-at-the-heels county town (3650m), Sichuan restaurants far outnumber Muslim noodle joints, and many locals seem to regard nearby Ngawa town (rather than the Golog capital of Dawu) as the focal point of the region (and, by extension, Chengdu as the closest big city). There is not much going on in the county town, but the nearby sacred mountain range of Nyenbo Yurtse is more than enough reason to make the long, painful trek to this remote area. The spectacularly beautiful glacial-lake-studded sacred range of Nyenbo Yurtse was, for several years, at the top of my list of places to visit. Then, I went. Despite more tourism than I had expected (there is an official entrance gate with a high fee, and we saw several Chinese groups on guided multiday hiking trips – unusual for Qinghai), Nyenbo Yurtse is still on (or at least near) the top of that list. Unusually for such a remote area, there are a surprising number of Chinese tourists who come here (mostly from Chengdu or Xi’an), or at least to the lake at the main entrance [note: these numbers are still orders of magnitude lower than other regions of China]. Even more surprisingly, it seems a moderately popular place to go backpacking. During a four-day trip, I saw three groups of Chinese hikers, whose Tibetan guides were leading horses laden with baggage. That being said, it is far from overcrowded; it’s simply surprising to find tourists at all in such a remote area. Nyenbo Yurtse is actively promoted in Qinghai, Gansu, Sichuan, and Shaanxi provinces, and apparently active tourists have listened. As such, there is a bit (not much) of infrastructure (if it can be labeled as such) in the area. Below the Ximencuo lake, there is an entrance gate where you will be asked to pay 120 kuai; this can be avoided by hiking in from other areas. After the gate, there is a 4km road to a parking lot near the lake; boardwalks lead tourists down towards the lakeshore, and a small gated camping area near the parking lot (along with two small tent shops) are available for those who want to stay the night. This is the only place that sees any significant tourism. The rest of the region is quite wild, though many nomads have been enlisted as rangers of sorts and might ask you to pay 20 kuai to camp (apparently the standard China National Parks fee). But other than these “facilities”, things are as wild as anywhere in Qinghai. The trails are unmarked and made by yaks, horses, and sheep. There are no marked/specific campsites. 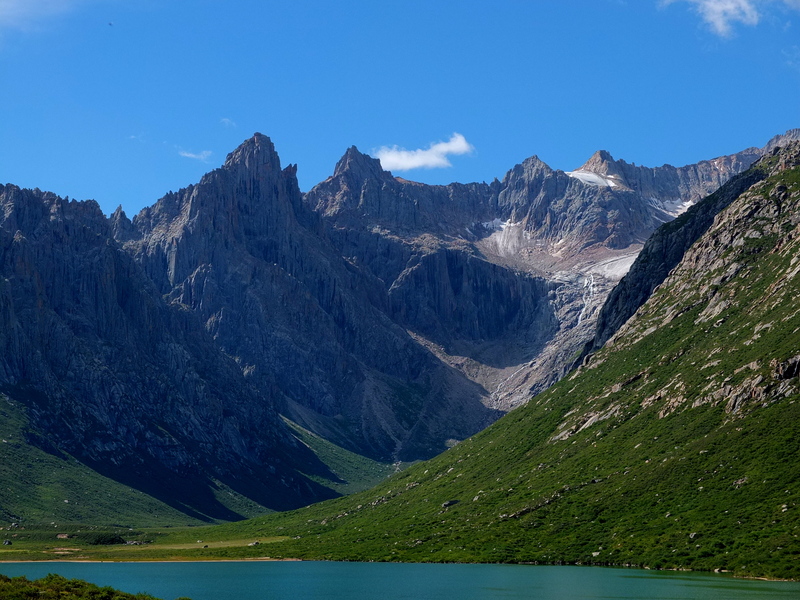 And as long as you don’t cross the nearby border with Sichuan (and consequently enter a sensitive region), you’ll be able to explore the area’s glacially carved valleys, lakes, and pinnacles for days. Hi Jonas, I just back from Nyenbo Yurtse this August’2017. We were there on a camping, and they required us to pay 30 yuan for it, and 100 yuan if we sleep in the big tents. The camping was not allowed on the lake shore, but just beside the parking lot. The entrance ticket price remains the same- 120 yuan. There was a lot of garbage on the small path at the west coast of the lake. But with exception of this, everything else is very wild and beautiful, and the views are breathtaking. Yes, we met many trekkers who go or back from their few days trekking route in the mountain. So if we go there next time, we plan to do a few days trekking too. Hello! Thanks for the great updated information. I’m hoping to get back there in the next year so I can update info.